For some time now, I’ve been saying I am in a rush to the finish line of this adventure. 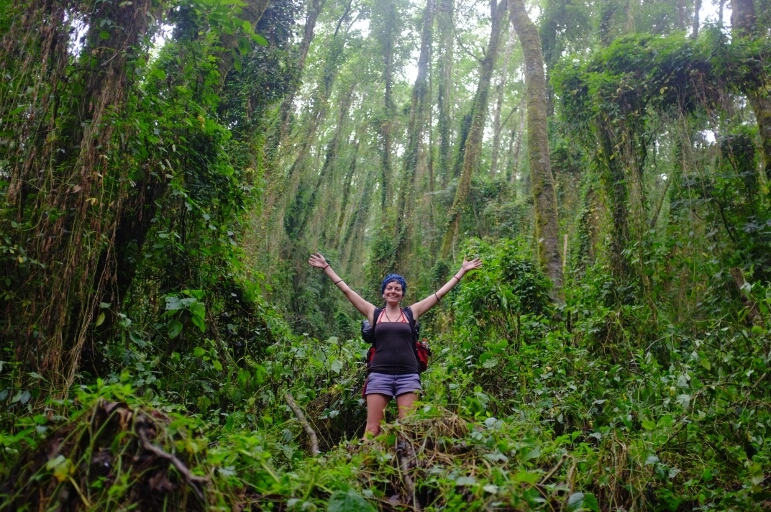 A race to the long anticipated goal of cycling 8,000 miles from Canada to Panama. Panama has been my mantra for nine months now. 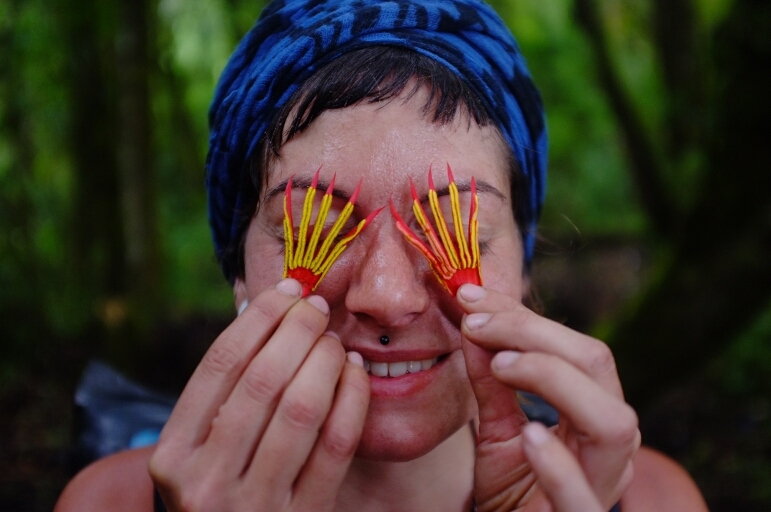 This monomaniacal focus leaves little room for extended stays as each day in a place is one further from the finish. This being said, lately, I’ve been spending weeks in beautiful places. “Uno mas” has become a running joke. “One more night!” I say more and more frequently. It just so happens I am “stuck” again at Lago Atitlan feasting earlier than intended. There is a reason I rarely make plans. I am sad to leave this magical place after knowing so little of its beauty. fortunately or not this is all this trip was every meant to be: a smorgousboard of people and places where I look but rarely taste. This voyage is a teaser to be tasted later in life when I can sit and dine on the finest of sampled cuisines. Lago Atitlan, and its surrounding villages, are a cuisine I will later return to feast. At the time of last writing I planned to ride with Pedal South to Antigua, another city in Guatemala. We were packed and ready to leave the morning of Saturday March 18th. Our constant need of wi-fi wasted the morning away in a cafe punching keys of computers and tapping tiny screens. 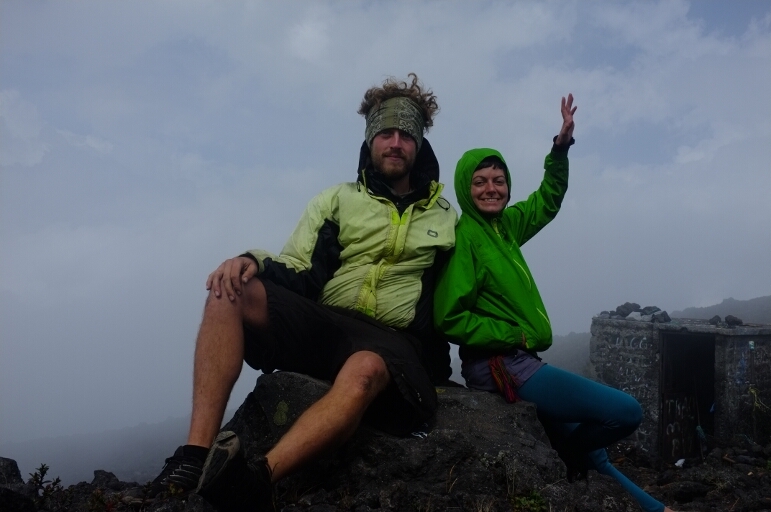 Then, Pedal South made their way up the grueling climb out of the volcanic crater that is Lago Atitlan. I made my way to a hostel in town, where another group of cycle tourers where camped, and planned to catch the heavily loaded group the next day. But, I never left. 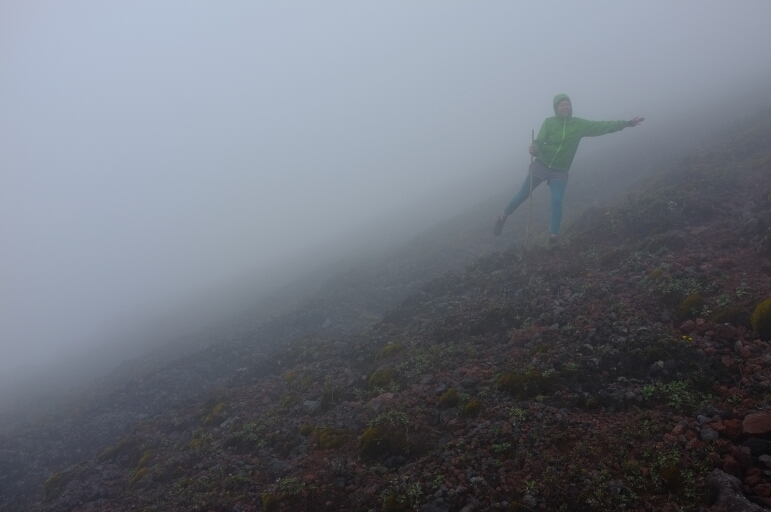 I was invited to climb a volcano. 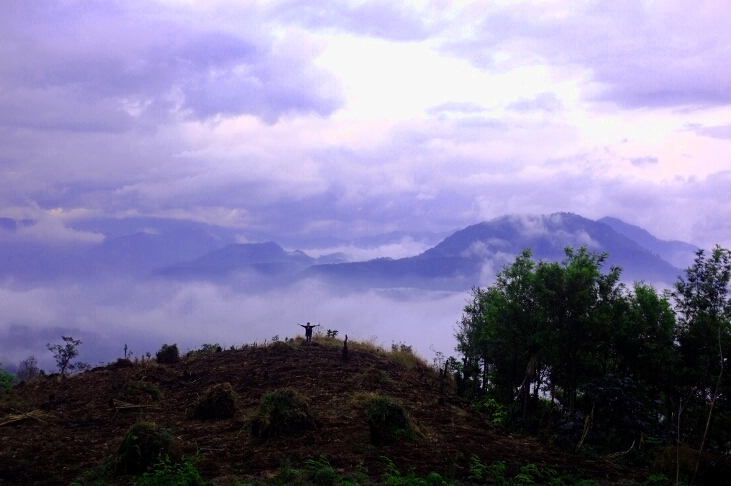 Clouds build in the sky blotting out the peaks above as we enter the valley where the volcanoes split. To the left is Volcan Atitlan. 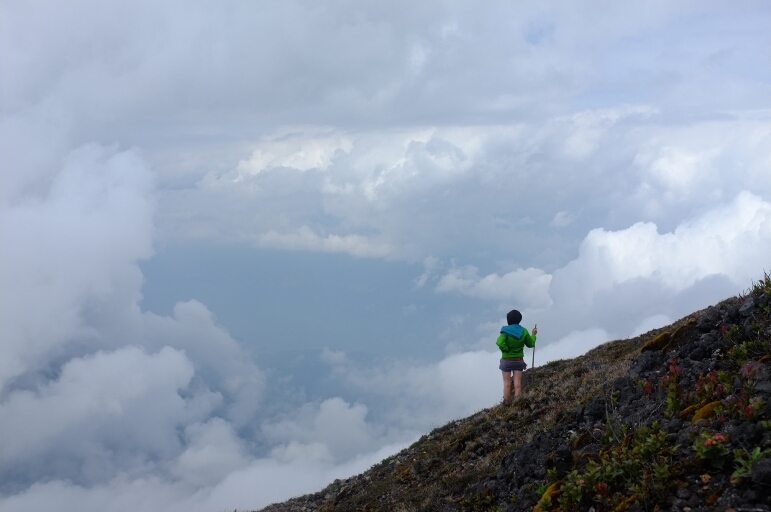 At a height of 11,598 feet (3,535 m), it is the highest of the three volcanoes surrounding Lago Atitlan. To the right is Volcan Taliman, a twin peaked volcano and our goal for the day as the others have already climbed the slightly higher Atiltan. We have been climbing for the last five hours. 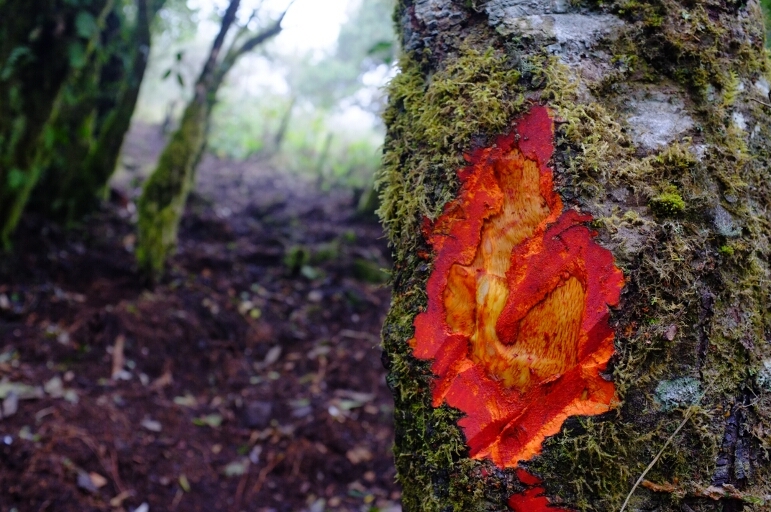 We pass a sign nailed to a tree pointing the way to Volcan Atitlan. We missed an earlier turn and steadily progressed upward along the trail to the higher peak. We hoped for a secondary trail leading up from the valley between the peaks. 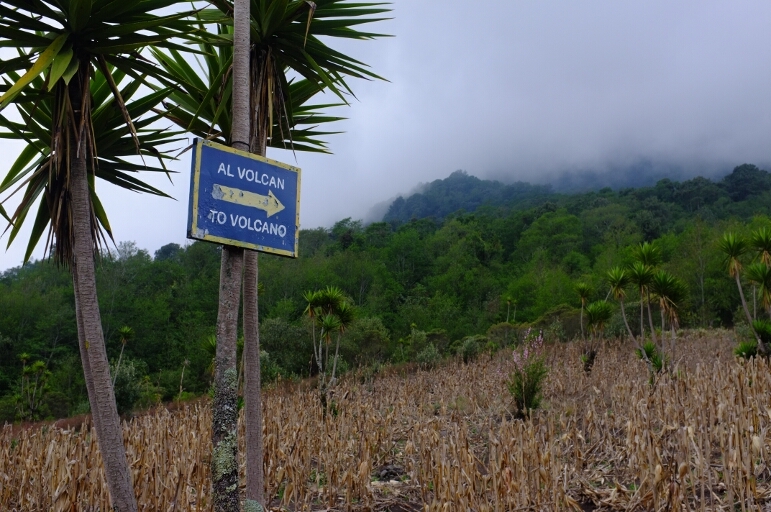 At the sign a small trail leads through a farmer’s field of sprouting corn in the direction of Volcan Taliman. Our feet sink in the loosely mounded soil intended to keep the heavy rain of the rainy season from washing it away. As the dirt of the field filled our shoes the clouds of the sky filled with rain and rumbled. Fearing being caught in the open on a high volcanic peak, and none of the group being prepared for rain, we retreat through the field to the sign directing us to Volcan Atitlan. 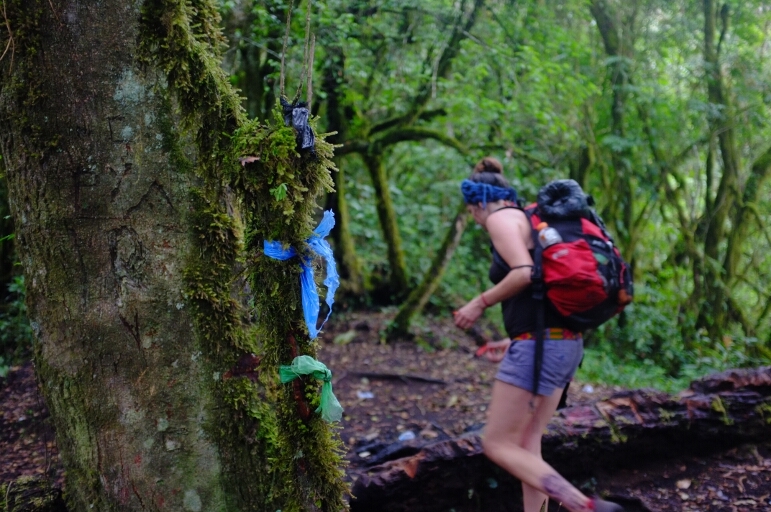 Having climbed just a few days before, the group knows of a sheltered campsite only slightly up the trail. The campsite is strewn with garbage and looks more like a dump than a place for sleeping. Most of the group clears the trash while others begin stringing up tarps to keep us and our gear dry. Rope is in short supply but, between us, we procure enough to hang the 10’x8′ blue tarp, on the edge of the fire already being built, and another on the other side of the fire pit. We are lucky. Thunder only threatens while the rain falls. Tent city would not have survived the onslaught of heavy wind and rain which would have reduced my journal and notebook to pulp and possibly have seeped through the plastic grocery bag to the ruin of my camera. 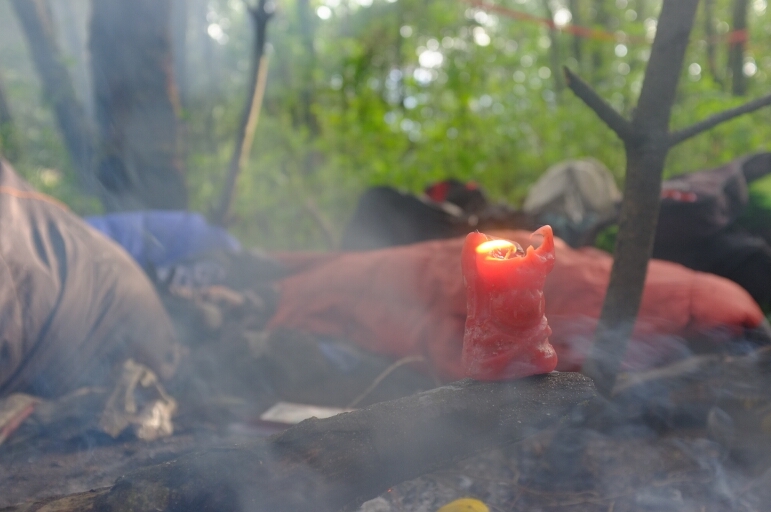 The night passes huddled around the fire under the shelter of the two tarps. A third, which was to be my ground cloth for the night, covers the large pile of packs. We make the most of our time playing instruments that were lugged painstakingly up the mountain. One man strums a guitar for hours while another pats a large drum called a djembe. The drum passes hands throughout the night but the singing guitar player entertains us nearly the entire night. In continuing good fortune the rain stops at midnight in time for us to sleep. Three tents are home to a few while the rest, including me, lay crammed in a row beneath the blue tarp. 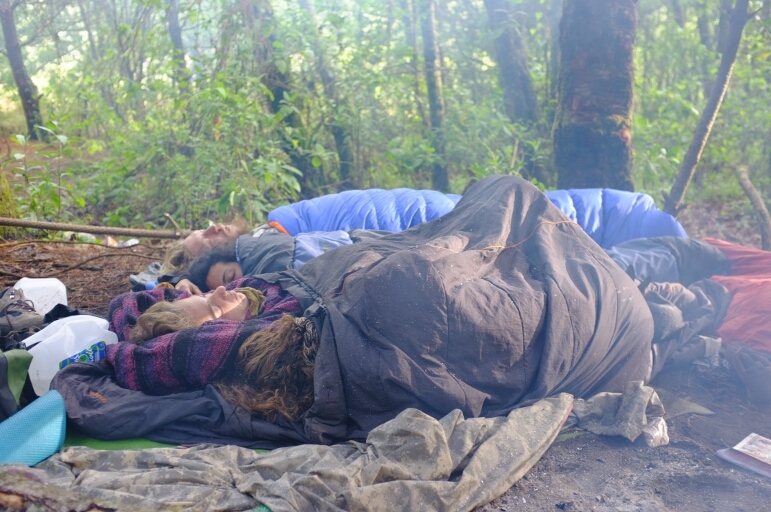 Someones small tent is shared for a groundcloth partially protecting my sleeping bag from the wet dirt of the earth. I take position on the downhill side of the group laying half on a log to keep from rolling down the hill in my sleep. At sunrise I awake surprisingly rested though craving my morning coffee routine. My stove was just too much to lug up the mountain in my tiny pack. Had I a larger backpack, I bet it would have made the journey. I love coffee. 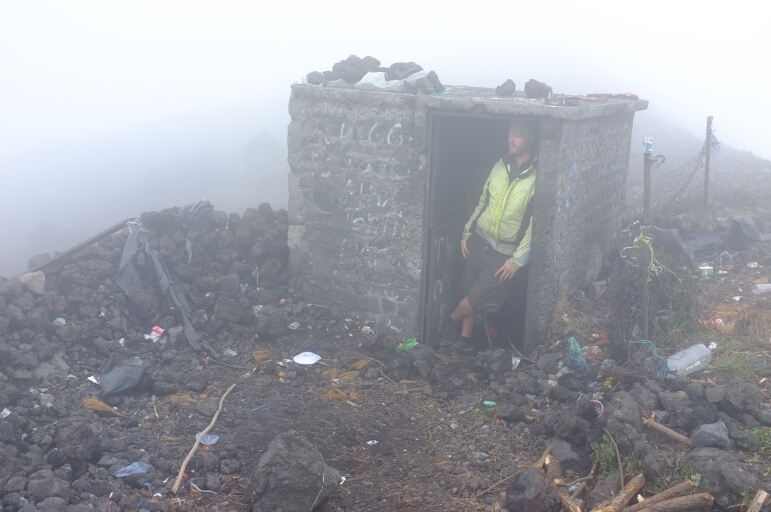 The morning wastes away until nearly noon when someone decides to accompany me to the top of the volcano. Noon is late and we will need to hurry. Had I only known this decision would cause what felt like the worst pain of my life. The remaining half of the climb is the steepest portion. Man-sized walls of rock and dirt need careful climbing. Steps cut into the hillside are often hip height. 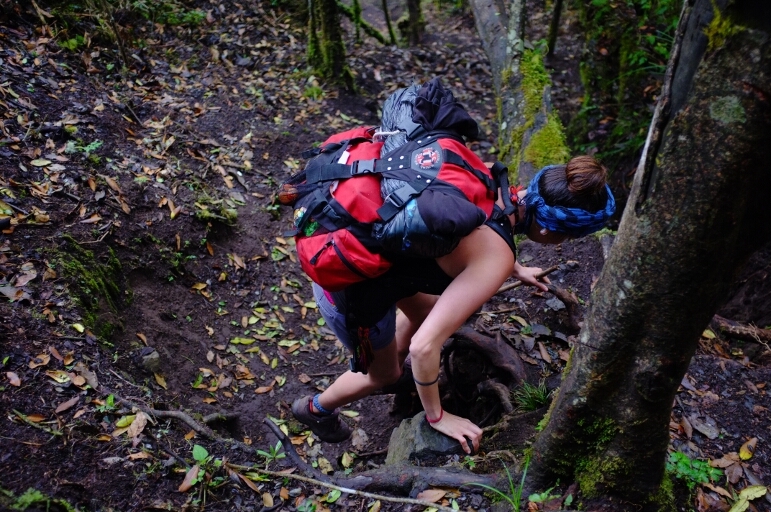 The climb is difficult and made more so by wet soil. We slip and we slide as we pull our way up using rocks, roots, and trees. 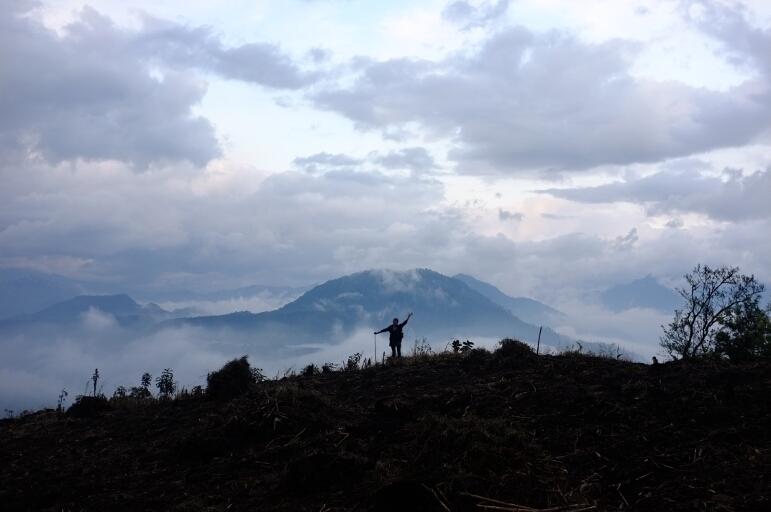 Two hundred meters from the top and there are no more trees. 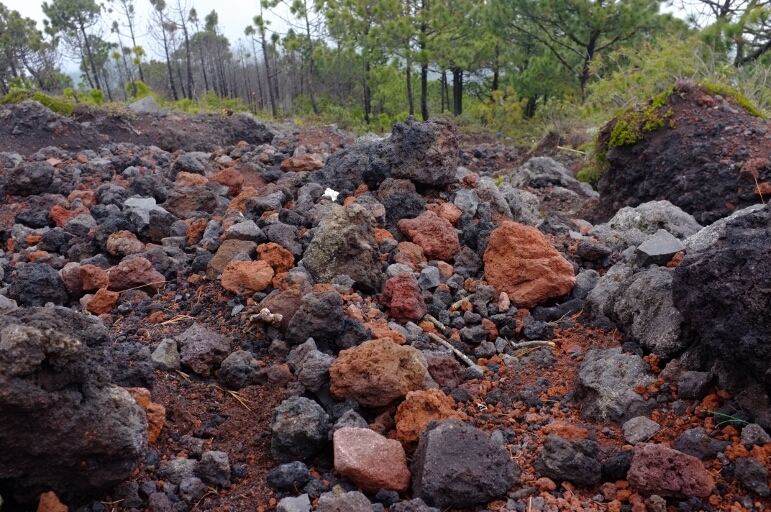 They were blasted away in a violent eruption along with the top soil needed for regrowth. 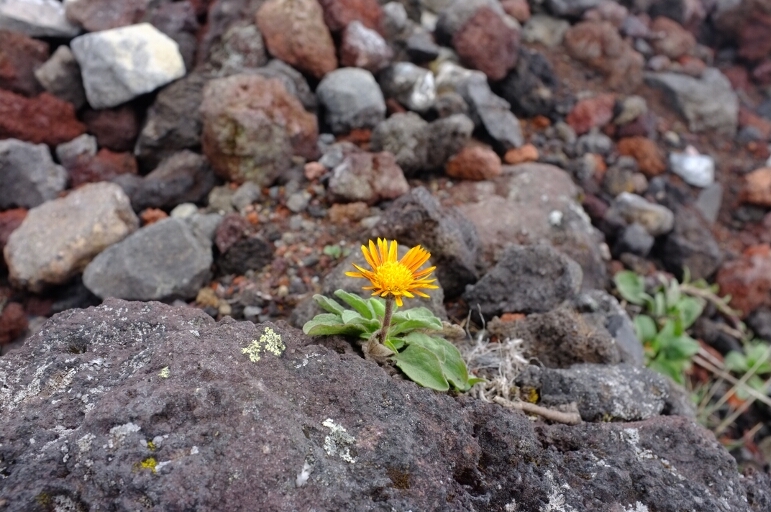 A few yellow flowers add variety to the red rocks of lava that completely cover the ground here. The climb steepens to nearly 45 degrees. I look around and become dizzy. 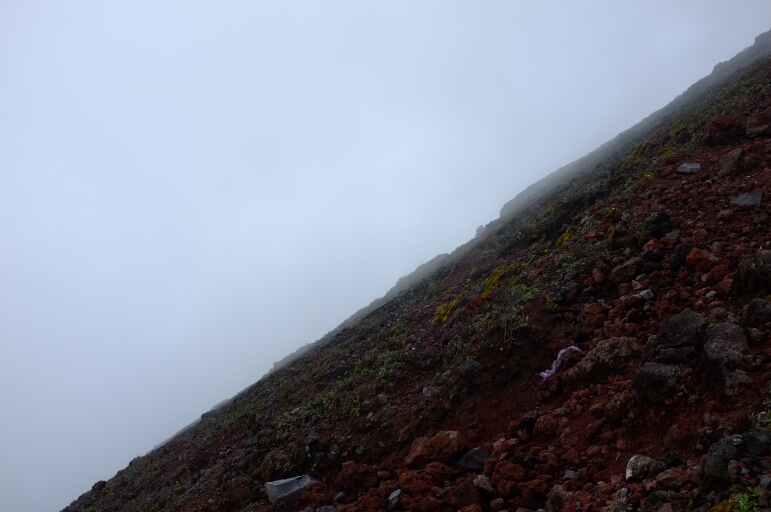 The steepness of the terrain is disorienting. Somewhere between two and three in the afternoon we reach the top. Clouds, unfortunately, reduce our view to mere feet as we explore the surface of the moon. Large hunks of sharp-edged rocks litter the ground. Moon-shaped mounds of these rocks form windbreaks for those who have camped here. I huddle in a small building to write. The wind is intense up here. The air is cold. We spend little time on top before descending. I do not want to be caught on the mountain after dark and we have no provisions to camp another night. We nearly run down the volcano making it safely into the town shortly after dark. The next day I woke to stiff legs. Walking helped but was not enough. 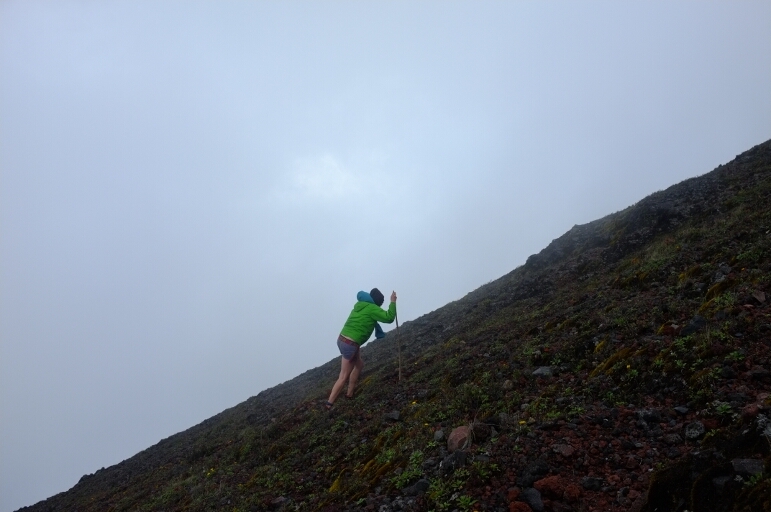 There was no saving my muscles after racing half-way up a volcano and all the way down in one day. The second day, walking was unbearable though necessary. The pain with each step, especially downhill, nearly brought me to my knees. The feeling began in my legs and ran into my stomach making me nauseas. The pain was so intense I thought I would puke. The third day was much the same with my time spent on my back reading in the sunlight filtering through the bamboo leaves of Merlin’s front yard. Short walks brought tears to my eyes but helped ease the stiffness and rid my body of lactic acid. The fourth day I was back to normal riding around town and hiking to distant cities. 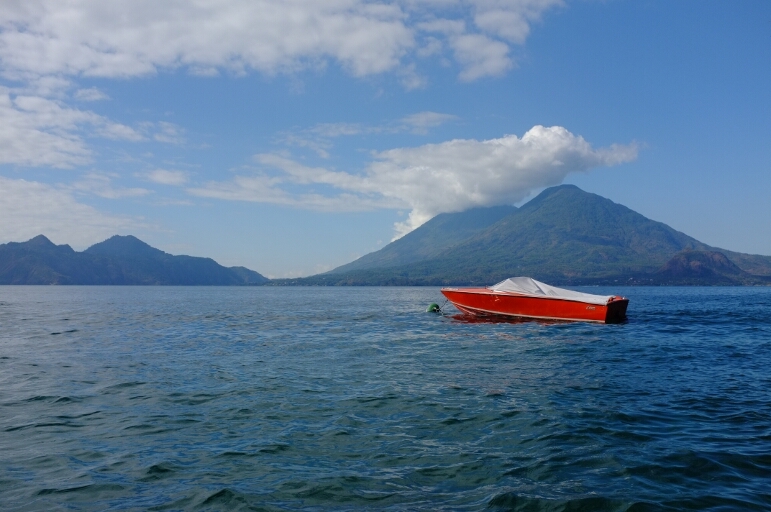 A journey to climb volcan Atitlan begins with a boat ride from Panajachel to San Lucas. This region is known for its coffee. Large square regions of the volcano are clear cut. 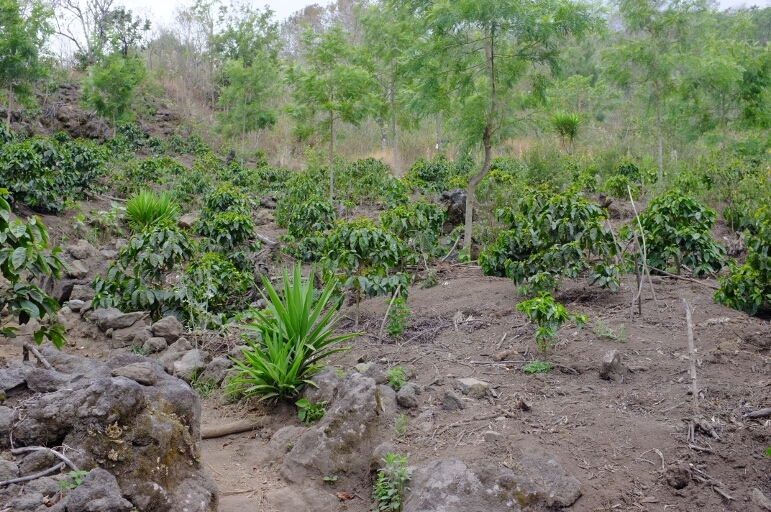 Then, coffee plants and shade trees are planted at the same time. 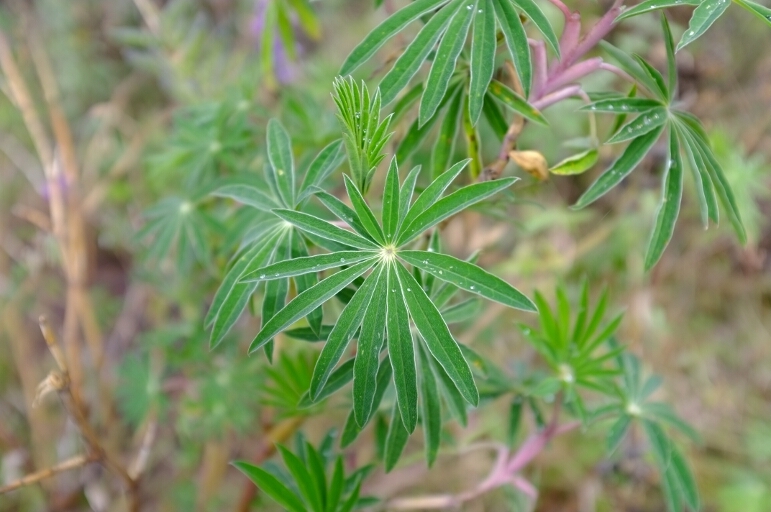 As we progress up the mountain, each years growth can be seen. One section is small like in the picture. Higher up, the plants get taller and taller. 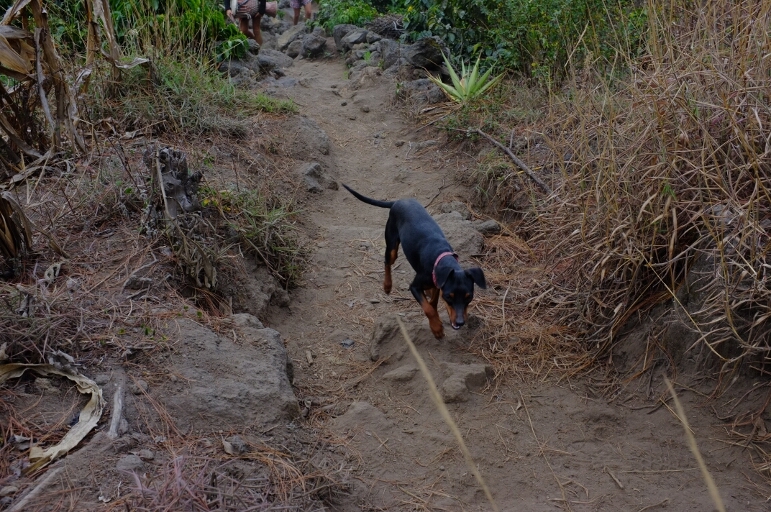 Scout leads the way up the climb. I have no idea what these flowers are but they are really cool. Follow the blue plastic bags. If you get lost, look for the machete marks. A flower in the rubble. 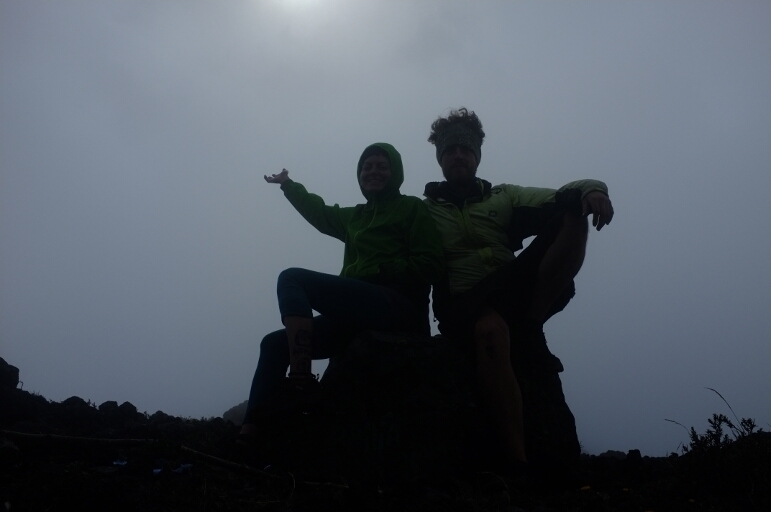 The best view we had was this small window through the clouds as we neared the summit. Still, increible! 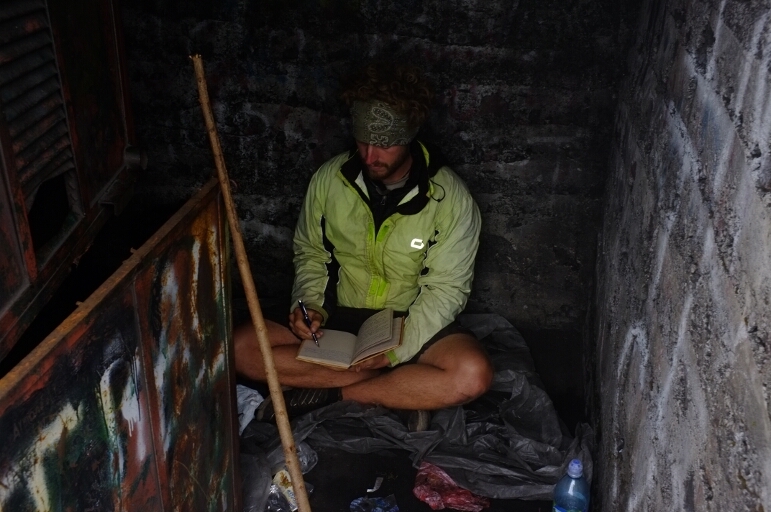 Getting out the cold for some journal time. At times, the fog was so thick we couldn’t see each other. Adios Volcan Atitlan. Thanks for the wonderful time! thanks for that little paraghraph..
Did you get your bike fixed yet? No. Just arrived in antigua. I’ll have the wheel rebuilt here as well as fix my pannier and buy a new shirt. It’s just not a shirt anymore. 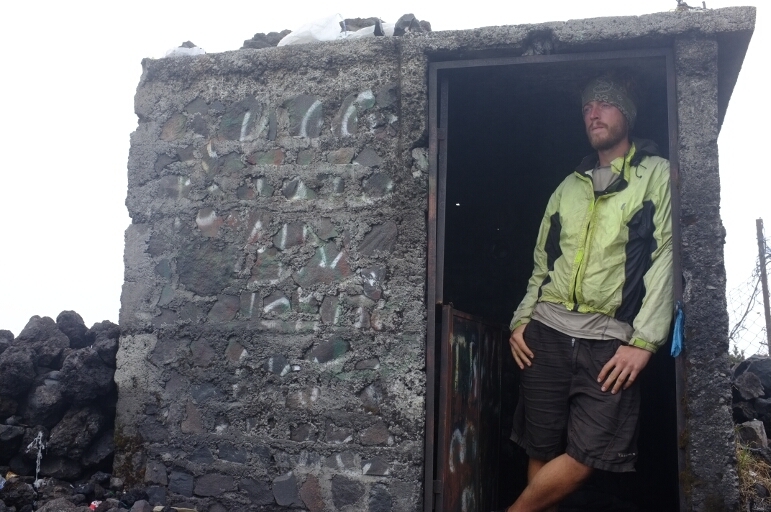 Climb an active volcano? !